The previous post looked at possible methods of building and providing housing for an Antarctic colony. This post will go into slightly more depth about materials that could be used. Using a custom designed mix of fibrous cement with a high insulation value may be a viable option for Antarctic construction. Some of the most well known mixes such as the ill fated Asbestos filled Fibro and the lesser known Papercrete likely wouldn't preform well in Antarctica. However, using a different fibrous material, such as hemp fibers combined with other insulating material may yield stronger and more well insulated structures. Standard rebar reinforced concrete could be used for load bearing walls and support columns. Hemp fibers could be initially imported and later grown locally in large underground hydroponics bays. If a small cement factory could also be established, that would reduce the reliance on imports and make a partially self-sufficient Antarctic construction industry. Fibrous cement is an amazingly versatile material and can be used for building everything from insulating shells for underground tunnels, interior walls, water pipes, to furniture and even novelty items. Certain mixes of fibrous cement can even be worked and sculpted like clay. Blocks or bricks can be poured in standardized sizes. Custom sized blocked can also be produced fairly easily. Entire walls can be poured into place if need be. There are many possibilities with various mixes of fibrous cement. The ability to produce it locally on site and customize it would seem to fit well with the needs of an Antarctic colony. Another option, while not suitable for indoor construction, should not be overlooked for building outdoor unheated structures. A version of Pykrete could also be produced with locally grown hemp fiber pulp and used to make things like outdoor cold storage buildings. Simple things like walls and wind sheltered walk-ways may be appropriate for this material too. As was mentioned on in the last post, radiant barrier material alternating with layers of air pockets may provide a high insulation solution for interior spaces. Fibrous cement could easily be incorporated to frame and support those layers of radiant barrier materials. This would likely be far more cost effective than other conventional materials like wood, and would also offer superior fire protection. If anyone has any input or alternative suggestions feel free to add them in the comments here. Building anything in Antarctica is difficult. The lack of conventional resources such as timber and the remoteness of the continent alone make traditional construction a challenge. This post aims to outline alternative methods of construction that may produce buildings suitable for an Antarctic colony. Most of the structures built in Antarctica today are not well enough designed to serve a permanent colony. One fundamental flaw is they are built above ground and thus are subject to the forces of the wind and extreme cold. In addition to this most structures leak out heat through windows and doorways further increasing the energy required to heat them. The easiest way to combat this would be to build structures underground. The permafrost in Antarctica would provide a temperature stable environment year round. I have been unable to locate reliable sub-surface temperate data for Antarctic permafrost at various depths. So, for the following example I will use estimates. If anyone has that temperature data please send it in or post it in the comments section here. Note the following estimate is given in Fahrenheit. If you build below ground and your sub-surface temperate is a stable 25 degrees, and you heat your buildings to 65 degrees you have a constant temperate differential of 40 degrees to maintain. Now, if you build above ground and the outside air temperature is -50 degrees, and you heat your buildings to 65 degrees you have a temperate differential of 115 degrees. It's fairly easy to tell that the 40 degree temperate differential is going to take far less energy to overcome than the 115 degree differential. One of the most important ways to reduce heat loss would be to build extremely well insulted structures. The use of commercially available insulting materials like the Thermalkool radiant barrier (which is paper thin and is rated R52) and other materials like mylar would help greatly. Using these materials in alternating layers with air pockets between it may be possible to build walls rated over R300 that are less than one foot thick. For comparison, the typical American home uses fiberglass insulation that's usually rated R30. Another way to further reduce heat loss would be to seal the buildings air tight. Preventing air and with it heat from escaping the structure would reduce the energy demands needed to heat it. This of course presents an additional problem of maintaining a constant fresh air supply. For this an air exchanger system combined with a thermal energy recovery system via the use of Stirling engines or another thermal energy conversion technology could be used. One example of such a system would be to have the cold fresh air intake shaft and the warm air exhaust shaft run parallel to each other with a number of Stirling engines sandwiched in between them. The temperature difference between the cold outside air and the warm air from inside the buildings could be converted back into electrical power this way. Also, a small amount of the waste heat would be transfered though the plates on the Stirling engines providing a small warming effect for the incoming air. This method could also be used with large chambers to effect a single large air mass at one time rather than a shaft system. A chambered system may also allow for multiple stages of thermal energy recovery and air intake heating to occur further increasing the energy efficiency of the system. Of course the larger and more complex the system the more it would cost to build and maintain. Permafrost is notoriously difficult to dig through. However, with the use of explosives and modern tunneling techniques, that should be fairly easy to overcome. It will likely be far more expensive to build any sort of tunnel or underground structure in Antarctica compared with the rest of the world, but building any structure in Antarctica is already more costly than elsewhere. If the underground structures are well insulated as described above, that will enable the surrounding ground to remain frozen. This will serve to increase the stability of the structures and tunnels requiring less bracing and support. There are a number of natural caves in Antarctica. There have even been accounts of stranded sailers surviving winters in caves on the sub-Antarctic islands. Many of those caves, especially on the continent have yet to be explored. Many more are buried and hidden under hundreds of feet of ice. It is possible there are caves large enough to build a colony inside them. Unfortunately, the odds of a large natural cave being in an accessible location suitable for a colony are slim to none. This does not mean the exploration of natural caves should be completely ruled out. It may be possible to enlarge a small natural cave to suit a colony. Tunnels between various smaller caves could in theory be dug to connect them. This would largely depend on the area to be colonized and features of the surrounding ground. In the last post on Power, VAWTs (Vertical Axis Wind Turbines) were mentioned as a potential power source for an Antarctic colony. This post will attempt to elaborate on that technology. 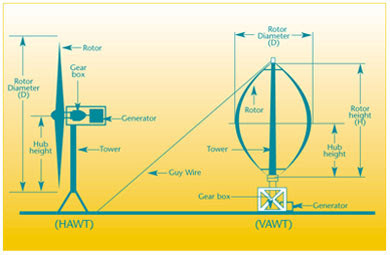 Below is a basic design of a Vertical Axis Wind Turbine. At low wind speeds traditional HAWTs (Horizontal Axis Wind Turbines) are more efficient. However, at higher wind speeds VAWTs can be up to 8 times more efficient than HAWTs. VAWTs can also withstand much higher winds, with some commercial models being rated to withstand winds in excess of 140mph. At those wind speeds most traditional bladed horizontal turbines would break or suffer damage. VAWTs on the other hand can continue to produce power even in those high wind conditions without risk of damage if they are designed and constructed properly. A specially modified Vertical Axis Wind Turbine would be ideal for power production in Antarctica. Such a VAWT would be able to withstand the most extreme winds without breakage. A built-in self-powering defroster would help prevent the exposed areas from freezing up or being damaged from extreme blizzard conditions and excessive ice buildup. Such a system could use it's own power channeled through small heated wires running along the structure and critical components. This in theory would not take a great deal of power and would most likely only need to run occasionally. It would only need to produce enough heat to melt the offending ice and snow. Considering the high and fairly constant winds available in some areas of Antarctica, a higher than normal output efficiency would likely be easily achievable with the right gearing. This high output would hopefully provide a great deal of extra power to heat a colony and also help to compensate for low wind periods. Details of a thermal energy storage and heat recycling/recovery system will follow in future posts. Such systems would greatly improve the overall energy efficiency of an Antarctic colony. Above and to the left is a traditional Horizontal Axis Wind Turbine, with a Vertical Axis Wind Turbine on the right. There are a number of technology challenges to be addressed by any serious attempt to colonize Antarctica. This post aims to touch on only the power or electricity generation aspect. In order for humans to survive in Antarctica we will need ample power. A system to generate more than is needed and store the surplus energy for peak demand times would be optimal. However, this is easier said than done. There are several options available. Although, if we are to adhere to Antarctica Treaty we will need a power solution that is green and pollution free. This rules out Nuclear, Coal and Oil. Geothermal power would be a good option for an Antarctic colony. However, it has a number of drawbacks. A geothermal power plant's high initial cost (est. $20-30 million) and inability to scale being the main obstacles. The benefits being a clean and constant flow of both power and heat should not be overlooked. For those reasons it should be researched and kept as an open option for further debate. Harnessing the power of Antarctica's natural wind power would seem like an ideal solution, as Antarctica is the highest and windiest of the continents. Wind power much like geothermal also has it's drawbacks. These being a lack of power in low wind conditions, wind generators freezing up, and possible breakage and other equipment failure in the extreme Antarctic conditions. With adaptations to present technology it may be possible to overcome the drawbacks of conventional wind power technology deployed in Antarctica. Low wind conditions could be compensated by building wind generator platforms on multiple sites. When the wind is low in one location it will most likely still be blowing in another location. It may be as simple as spreading out wind generators over a large enough area to provide constant power flow. Freezing up can be avoided or minimized by the installation of defrosters on the wind turbines themselves. Also, it may be necessary to occasionally send a maintenance crew to clear ice and snow from the generators and platforms. Breakage and damage to the wind generators can be reduced or minimized by using VAWTs (vertical axis wind turbines) instead of conventional HAWTs (horizontal axis wind turbines). VAWTs, although, not as efficient at producing energy as HAWTs are far more durable, especially in high wind conditions that is prevalent in Antarctica. Also, the base of the VAWTs being on the ground makes maintenance much easier. VAWTs are cheaper to build, install and maintain than HAWTs, which is yet another advantage. The downside being that they will have to be built in minimum groups of three, as the tops will need to be linked together for support. Otherwise a large and expensive support frame would need to be constructed for each wind turbine. Of course many of you reading this may be curious as to why if VAWTs are so good, why are they not already being used widely? The answer is simple, HAWTs are far more efficient in low wind conditions. Also, HAWTs are usually built on towers that increase height, allowing access to higher wind speeds at higher elevations. This is simply not as much of an issue in the wind swept high elevation regions of Antarctica. Another major hurdle to overcome will be storing the excess power generated. As any storage solution will need to be environmentally friendly. For that hydrogen gas would seem like an ideal choice. If the colony is located near the ocean, salt water can be drawn up into tanks and the extra electric power can be used to convert the water into hydrogen and oxygen gas. The hydrogen gas can then be compressed into tanks for storage and use. It could be used to power everything from vehicles to stoves to electric generators. This may well be the best viable option for a backup and power storage system. Because of the vast temperature differentials present in Antarctica. This may be a golden opportunity to explore an alternative technology like the Stirling engine. The Stirling engines can run a motor or electric generator off of two plates, as long as a temperature difference exists between those two plates. The ocean water, the ground or even the ice itself and the surface air above could be used to run motors and create power with no other inputs. These technologies describe here all exist today. More information on them can be found readily at sources like Wikipedia and others. All one needs to make them work as described is proper funding, a little ingenuity, some hard work, plus the drive and determination to get things done and this could become a reality. This is just a small sample of an ongoing project to collect time-lapse imagery of Antarctica. I have taken over 1,000,000 individual photos and worn out a number of cameras that make up the collection of footage I have gathered so far over the last 5 years. Eventually a film will be released, keep an eye on my user page for more info in the future. For those of you who have been asking about the music I used here, the first piece of music is "Whirl-Y-Reel" by Afro Celt Sound System, the second is from the Edward Scissorhands soundtrack by Danny Elfman. Both are available at most music outlets. This blog is dedicated to providing information and updates about the coming effort to establish a permanent, independent and sovereign human colony in Antarctica. As of the posting of this there are no permanent human settlements in the Antarctic. Only scientific bases and research stations exist there now. We hope to change that while abiding by the letter of the Antarctic Treaty by not polluting or being backed by any government. Our efforts shall be entirely private in nature. Stay tuned to this blog for more information and updates about the official launch of ColonizeAntarctica.com !